An arch dam, the 1,001 feet high Jinping-I Dam is the tallest dam in the world. 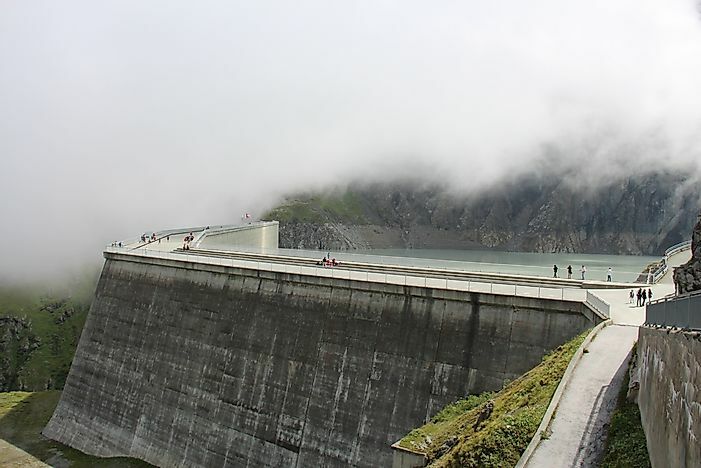 The Grande Dixence Dam in Switzerland is the fifth tallest dam in the world. The tallest dam in the world is the Jinping-I Dam standing at 1,001 feet high constructed in River Yalong, China. Construction of dams is a common method used to tap water for supply, power generation, flood prevention, and storage. The advancement of technology has facilitated the building of bigger and more efficient dams across the world. China has the bulk of the tallest dams in the continent as well as in the world. Standing at 1,001 ft is the Jinping-I Dam sits along the Yalong River. The dam’s construction commenced in 2005 until it was finally completed in 2014. Hydro-electric power generation is the primary purpose of the dam also referred to as Jinping-I Hydropower Station. The second tallest dam is found in Tajikistan, known as the Nurek Dam. Construction of the dam began in 1961, and at its completion in 1980, it stood at 980 feet. China boasts the third and fourth tallest dams, the Xiaowan and Xiluodu Dams respectively. The Xiaowan Dam impounds the Lancang River, and it is 958 feet tall. It was constructed purposely for hydropower generation, and it was completed in 2010. The Xiluodu Dam rises to 937 feet along River Jinsha. It was constructed between 2005 and 2013 mainly for hydro-electric power generation. The Nuozhadu Dam, the world’s 8th largest dam, impounds the Lancang River in China. It is 858 feet tall, and it was completed in 2012. India is home to the Tehri Dam, the world’s 10th tallest dam at 855 feet. It was constructed along the Bhagirathi River from 1978 to 2006 primarily for water supply, irrigation, and to tap hydropower. The world’s 12th tallest dam stands at 820 feet on the Yellow River, China as the Laxiwa Dam. The Ertan Dam rises to 790 feet on the Yalong River in China to become the world’s 18th tallest dam. The Dadu River in China is home to the Changheba Dam which at 790 feet is the 19th tallest dam worldwide. The 5th tallest dam in the world began operations in 1964 in Switzerland as the Grande Dixence Dam. The dam is 935 feet tall and its primary purpose is hydropower generation. The Enguri Dam, at 891 feet, is the world’s 6th tallest dam. It impounds the Enguri River in Georgia, and it was constructed between 1961 and 1987. In 1959, construction of the world’s 7th tallest dam, the Vajont Dam, was completed. The dam lies on the Vajont River, and it has been disused after a major landslide occurred in 1963. The Mauvoisin Dam stands at 820 feet to rank as the world’s 11th tallest dam. The dam was completed in 1957 along the Bagnes River in Switzerland. The world’s 13th tallest dam impounds the Coruh River in Turkey as the Deriner Dam at 817 feet. Russia is home to the Sayano Shushenskaya Dam which rises to 794 feet on the Yenisei River. The Manuel Moreno Torres Dam is Mexico’s tallest dam and the world’s 9th tallest at 856 feet. It was completed in 1980 on the Grijalva River. The world’s 15th largest dam, the Alberta Lleras (Guavio) Dam, is located in Colombia. It stands at 797 feet on the Guavio River having been completed in 1989. Located in Canada is the Mica Dam which at 797 feet is the 16th tallest dam in the world. The dam was completed in 1973 on the Columbia River. La Esmeralda Dam, the world’s 20th tallest dam, lies on the Bata River in Colombia. The dam was built from1960 to 1976 mainly to tap hydropower. The tallest dam in Africa is the Gilgel Gibe III Dam in Ethiopia reaching a height of 807 feet and ranks as the world’s 14th tallest dam. The dam’s construction began in 2008 ending 2015 on the Omo River. The primary purpose of the is hydropower production. How Do Beavers Build Dams? What Is The Environmental Impact Of Dams And Reservoirs?